It seems treasures can still be found in attics, after a missing horror film turned up. The Tell-Tale Heart (1953) is a 20-minute British adaptation of Edgar Allan Poe's psychological drama. The film was rediscovered in 2017 when Jeff Wells, a 16mm enthusiast, found the reel in his loft in Drummore, near Stranraer. It has now been digitally restored, and will be made available to watch online in time for Halloween. Mr Wells, who had bought the film from a second-hand shop in Brighton in 1984, got in touch with Adelphi films after finding out it was missing from their catalogue. He had rediscovered it while clearing out his loft. Adelphi Films' manager Kate Lees had been actively searching for the film for the last 12 years. She said: "We are very excited to have found this film after searching for it for so long and had almost given up hope. "It is a really excellent film and Stanley Baker is terrific." Josephine Botting, British Film Institute (BFI) curator, added: "It's always exciting when a missing film comes to light, and an addition to both the catalogue of British producer Adelphi and the filmography of Edgar Allan Poe, is a wonderful discovery. "We're delighted to be preserving the 16mm print and also to make the film available online to new audiences via BFI Player in time for Halloween." 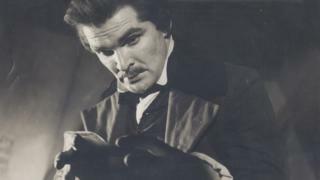 The Tell-Tale Heart, which stars Stanley Baker, will be available on the BFI website from Friday, for two weeks.